I got my hands on a few MSX-ENGINE Magazines... great magazines by the very enthusiastic MSX-ENGINE crew.. I got issues 4 up to 9... does someone know how many were made? The issues and magazine is missing on the Wiki mostly.... with some more info it can be added. I'm sure if you mail him he will tell you all you need to know about the magazine (which had very nice color prints). 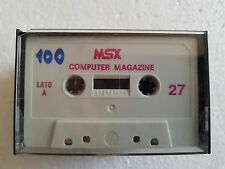 Do you still have the magazines? I've been talking with Loek via facebook. He recovered all issues from the attic (there were 10, apparently). We have plans to scan them so they can be put online (together with MSX-Kompas), but he has almost no time free to do that (it will be several hours of work, like 400-500 pages in total). At least I know someone with an A3-scanner, but he lives in Utrecht... Asking a company to do it is about 160 euro... that's not cheap, I'd say. I am willing to sponsor this scanning project (10 x MSX-ENGINE) for 15 euro. 15Euros from 16 people? I'm in! So, how do we get these magazines online, folks? 1. Someone who knows Loek borrows the 10 magazines. 2. We, as enthusiasts, pay some money (IBAN / paypal / ?). 3. As soon as there is enough money, the scanning can be done (through a company or by someone on a rainy Sunday who can use the money ;-). 4. The magazines can be returned to Loek. 5. Putting the magazines online.